As an Internet user, you need to keep track of passwords, accounts information, names and much more. One solution is to store everything on your computer and take the risk that anyone can gain access to your valuable information. iSafe is a security solution that will relieve you of the password management chore, while offering complete security and protection to your assets. iSafe allows you to keep your credit card numbers, bank account details, web based passwords, sensitive documents and more, all in one secure place. You can also create securely documents and encrypt data already stored on your computer to prevent prying eyes from reaching your valuable information. The installation of iSafe has no special steps – you just have to drag the file to your applications folder. When iSafe is started for the first time, you need to create your personal account. Once you have created an account you can login as that user by selecting it from the users menu. Records – Records are used to store passwords, credit card numbers, e-mail passwords and other personal information. Adding new records is done by clicking on the ´New´ button, choosing the desired record type (category) and filling the required details. 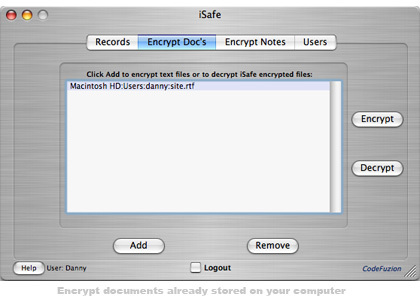 Encrypt Doc´s – Encryption of existing documents is done easily with iSafe. Select the document you want to encrypt and click on the ´Encrypt´ button. Use the ´Decrypt´ button to decrypt the items listed in the filebox. 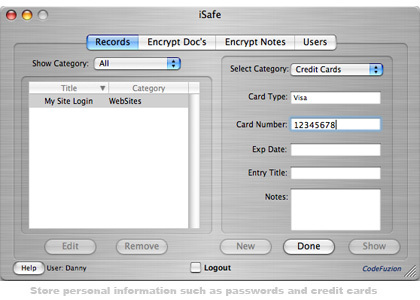 Both encrypted and decrypted files are placed in a folder called iSafe on the desktop. Encrypted Notes – Functions very much like regular text editors. You can directly type, drag text files into the textbox, copy and paste between this and other applications. Once text has been entered into the textbox it can be encrypted by clicking the ´Save encrypted as´ option.